The photographs and haiku which were judged the best are exhibited. 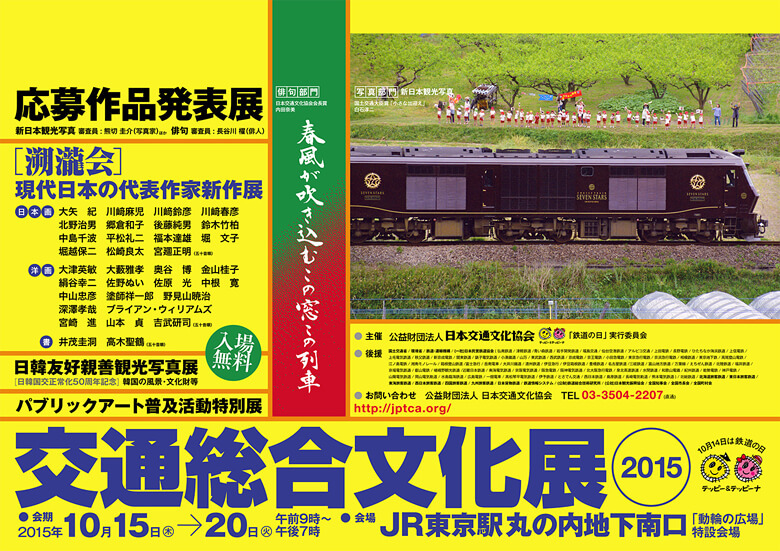 The Traffic Culture Exhibition is held at Tokyo Station from October 15 to 20, 2015 and is organized by The Japan Traffic Culture Association. The exhibition is located just outside the South Ticket Gate, near the Dorin Square (underground). The exhibition includes photographs and haikus submitted from all over Japan that have been judged the very best. Visitors can also enjoy new works of Sakuryokai, a representative group of Japanese style painters. Western paintings as well as calligraphy are also part of the exhibit. The Association is also displaying photographs from the Japan-Korea Friendship Tourism Photo Exhibition. These pictures, which introduce Korean tourist attractions, mark the 50th anniversary of the normalization of relations between Japan and Korea, and are a special offering of our public art promotional activities. We look forward to your visit. Opening hours: 9:00a.m. – 7:00p.m.